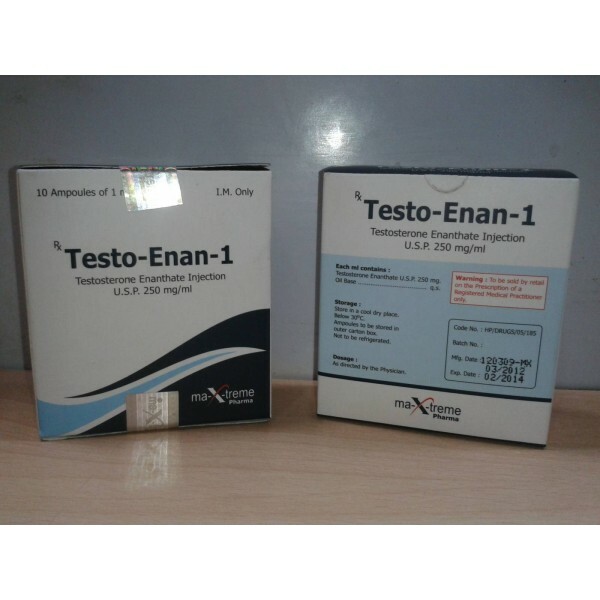 Testo-Enan solo– injection testosterone based on enanthate ester dissolved in oil, made specifically for slow absorption into the blood from the injection site. The peak of its release into the blood – the first few days, then its level in the blood gradually decreases within two weeks. In medical practice, testosterone enanthate solo is used to treat hypogonadism, that is, the natural lack of testosterone in the body. It is more convenient for the patient because much more rare injections are needed than when using testosterone propionate ester. Androgenic index – 100; anabolic index – 100; estrogenic activity – moderately high; progestogenic activity is low. The decisive advantage of Testo-Enan amp solo is that this active chemical with a very strong androgenic effect also has an anabolic intensity, so it is easy for everyone with it to add power and weight in the shortest possible time. Fast and strong weight gain is associated with a significant accumulation of water, because retention of electrolytes and water occurs. The accompanying effect is an incredible increase in strength, which keeps up with this accumulation of water in the body. Weightlifters and athletes of powerlifting, especially from high weight categories, highly appreciate this quality of the drug. For them, testosterone enanthate and Sustanon are steroids # 1, which is reflected in dosages. Doses of 500 mg, 1000 mg and even 2000 mg per day are not uncommon, mind you – per day, not per week! Sports that require brute force, aggressiveness, zeal, is the primary field of application of enanthate. Strong accumulation of water has other advantages. Testosterone helps those who have joint problems, those who complain of pain and crunch in the shoulders, and those to whom their intervertebral discs show the first signs of wear. Leads to muscle gains. The reason for the sharp increase in volume is the accumulation of liquids. It is caused by sodium retention and estrogenic hormone activity. After the end of the course of injection, rollback occurs. Muscle contraction may be less or more pronounced. Raises the level of power indicators. Develops male genital organs. The hormone is directly involved in the formation of such sexual secondary features as accentuation of male facial features, the acquisition of low timbre of the voice, the covering of the body with hair. Provides spermatogenesis, which is reflected in sexual desire. Improves phosphorus and nitrogenous exchanges. Relieves crunch in the shoulders, various problems with intervertebral discs, pain in the joints. Increases the tone and motivation to practice. Warns the onset of a state of overtraining. Increases the concentration of red blood cells.